Glenn Irwin completed a two-day test on the JG Speedfit Kawasaki at Guadix in Spain. Glenn Irwin says his debut test on the JG Speedfit Kawasaki has left him counting the days until the 2019 Bennetts British Superbike Championship roars into life. The Carrick man completed a two-day shakedown at Guadix in Spain on Thursday on the ZX-10RR along with team-mate Ben Currie. Irwin, third in the championship this season after competing in the Showdown for the first time, has joined the title-winning team after three seasons on the PBM Be Wiser Ducati. The 28-year-old was brought in as a replacement for outgoing BSB champion Leon Haslam, who will return to the World Superbike Championship next year alongside Jonathan Rea in the Kawasaki Racing Team. 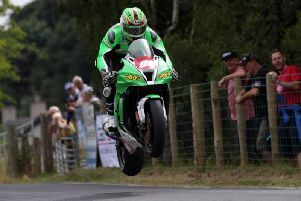 Irwin, who was riding a four cylinder machine for the first time since competing at the Sunflower Trophy meeting at Bishopscourt in County Down in 2015, said: “It’s been a really good two days and yesterday we got through 79 laps and we didn’t worry about going ultra-fast because the track is pretty green. “It’s just me and Ben (Currie) here and there’s not a lot of rubber down, but today we done another 79 laps on the button and we managed to go fast, which I’m happy about; a lot faster than I’ve ever been here before. “Anything I’ve asked for from the bike or any changes that we have done together, whether it be chassis or electronics, I’ve been able to understand and give the correct feedback,” he added. Irwin will now take a few weeks’ off before knuckling down to begin training in earnest as he steps up his preparations for a big year ahead. He said: “I almost wish that I didn’t have this test because now I know how good this bike is and this winter break is going to be long, but I’ve couple of weeks off now.